Do you wish you could shop for furniture in a quiet boutique setting where the choices are abundant and the staff is knowledgeable? You can – when you visit The Studio at Janet Brown Interiors – just a few doors down from our main shop in Cary Court. The studio offers personalized, accessible interior design services. Stop in to pick out a chair, make plans for a room, or discuss changes for your entire house. No appointment necessary. We are here to answer your questions and make you feel right at home. We offer so many lines, including the furniture of Hickory Chair from Hickory, North Carolina. Take a look at some of the company’s pieces . . . Interior designer Suzanne Kasler’s Regency-style home in Atlanta. “At Home With Suzanne Kasler” produced by Howard Christian. 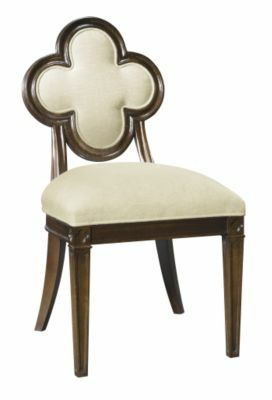 The chair in the master bath is a Suzanne Kasler design for Hickory Chair. The finish and fabric are customizable. Table, Suzanne Kasler for Hickory Chair. Interior design by Suzanne Kasler. “Colorful Connecticut Home” by Mimi Read. Choate Dining Table, Suzanne Kasler for Hickory Chair. “What I like about this table is the Regency feel. I wanted that modern mix in the collection, pieces that are more contemporary and others that are more antique. The simple details and the dark walnut finish are so modern, and the sides are tailored with brass details.” – Interior designer Suzanne Kasler to House Beautiful. Table pictured in cherry with walnut finish and brass. “Suzanne Kasler is Sitting Pretty With Her New Line of Chairs” by Aaron Krach. A Victorian-style pouf by Hickory Chair. Architecture by Spitzmiller and Norris. “A Gracious, Southern-Style Home in Tennessee” produced by Howard Christian. Hickory Chair stools are pulled up to the granite-top island.